President Erdoğan talks during a meeting hosted by the Turkish Foreign Economic Relations Board (DEİK) on Turkish-Greek economic ties on May 5, 2010. In a sign of changing times in bilateral relations, Greece will receive Turkish President Recep Tayyip Erdoğan next week. Scheduled for Dec. 7-8, the visit will be the first by Turkish incumbent president in 65 years. Although neighbors that share heritage such as cuisine and folk dances, the two countries have long had strained relations, with few improvements over the years. Erdoğan's visit might change this. Hakan Çavuşoğlu, the Greece-born deputy prime minister, has said it will "further" improve bilateral ties. "I think this visit will yield significant results," he said last week. Pointing to the recent high-level visits to Greece by Turkish officials, Çavuşoğlu said Erdoğan's visit would complement the previous meetings. The minister said a High-Level Cooperation Council meeting would take place in Thessaloniki in February, noting three planned projects between the two countries. The first one concerns ferry services to transport passengers and goods from Turkey's western Izmir province to Thessaloniki. The second one is a high-speed train service project between Istanbul and Thessaloniki, and the third project is a bridge between Greece's Kipoi and Turkey's İpsala border crossings. Turkey's third President Celal Bayar was the last Turkish president to visit Greece in 1952. During his tenure as prime minister, Erdoğan paid two official visits to Greece in 2004 and 2010. Relations further flourished under the government of Alexis Tsipras that came to power in 2015. Developing a personal relationship with Tsipras, Erdoğan had even gifted a tie to the Greek prime minister known for his tendency to dress casually, and when the two came together on the sidelines of an Istanbul summit, Erdoğan had jokingly asked where the tie he gave him was. Greece, whose territories were ruled by Ottomans once, was the invading force when the Ottoman Empire collapsed in Turkey. In the War of Independence, modern Turkey's founder Mustafa Kemal Atatürk staved off invading Greek forces. Since then, the two countries had at times strained relations, though a landmark visit by then-Greek Prime Minister Eleftherios Venizelos in 1930 sought to improve ties with a convention of friendship. Several thorny issues like the state of Cyprus, an island divided between Greek and Turkish Cypriots, sovereignty rights over the Aegean Sea, and the status of the Hagia Sophia, a Byzantine-era church converted into a museum, remain hotly debated between the two countries. 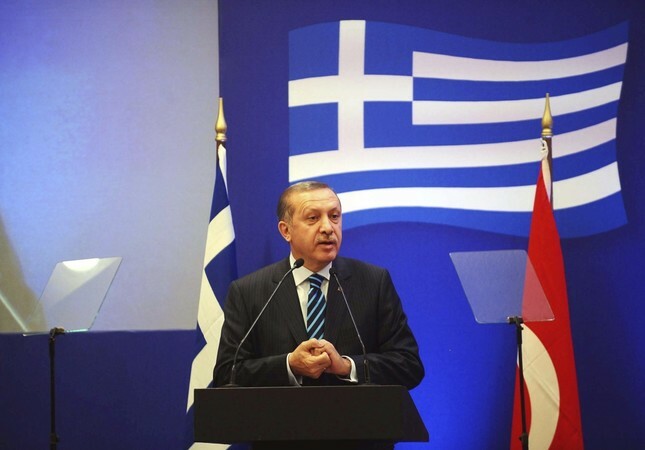 Turkey has recently been critical of Greece for giving sanctuary to eight pro-coup troops that fled there in a military helicopter they hijacked after last year's foiled coup that killed 249 people in Turkey. Still, the two nations remain closely bonded, especially after Greece's outreach to Turkey in 1999 after a devastating earthquake that killed thousands in northwestern Turkey. Both countries are also popular tourist destinations for one another. Turkey is also a partner in the European Union deal aimed to stem the illegal crossings into Greece by migrants, mainly from Syria, who risk their lives to reach nearby Greek islands from Turkish shores. Turkish Prime Minister Binali Yıldırım paid a one-day visit to Greece in June. Yıldırım and Tsipras had expressed their willingness to move forward at a joint press conference despite the above mentioned issues between the two countries. Touching upon pro-coup troops seeking shelter in Greece and a Greek court's decision to refuse their extradition to Turkey, Yıldırım has said they did not want the issue to "strike a blow to Turkish-Greek relations." Tsipras has said in a joint press conference with Yıldırım that he believed the visit marked an important step for both bilateral and regional developments, emphasizing that Greece wished to continue on a path of good relations with Turkey. "As neighboring countries, instead of trying to exploit each other's hardships, we should try to help each other. I hope we will continue to do this," Tsipras said at the press conference in June. In a related development, nine Turkish nationals suspected of links to the terrorist group the Revolutionary People's Liberation Party-Front (DHKP-C) were detained yesterday in Athens. The police said eight men and a woman were detained in the districts of Neos Kosmos and Kallithea. Greece remains one of the countries in which the DHKP-C is very active, and the terror group operates a camp, disguised as a refugee camp, located in the town of Lavrion, 60 kilometers (37 miles) southeast of Athens. The country changed its much-criticized policy of tolerance for supporters of the terrorist organization and a number of militants were arrested in 2014 in several operations, including high-ranking members of the group. The move was seen as improving the counter-terrorism cooperation between Turkey and Greece, although the refusal of Greek courts to extradite several suspects overshadowed the efforts. The DHKP-C, in addition to attacks against Turkish security forces, are responsible for a suicide bombing at the U.S. Embassy in the capital, Ankara. The incident killed a Turkish security guard and injured a journalist in February 2013. The group is an offshoot of a Marxist-Leninist movement that was established in the 1970s. It was founded in the 1990s after it splintered off from a larger group of far-left organizations responsible for a string of attacks that include the assassination of two politicians in 1980, several intelligence officials and Özdemir Sabancı, a member of the Sabancı family, one of the richest families in Turkey that owned a large conglomerate of companies. İsmail Akkol, a DHKP-C member involved in the killing, was captured in western Turkey last year, one year after a Greek court released him following his arrest.